Incredibly cringeworthy hearing the @NBCOlympics announcer give Hosszu's husband the credit for her success as a world-class swimmer. I understand wanting to put Ledecky's talent into context, and she does have a stroke modeled on Michael Phelps'. 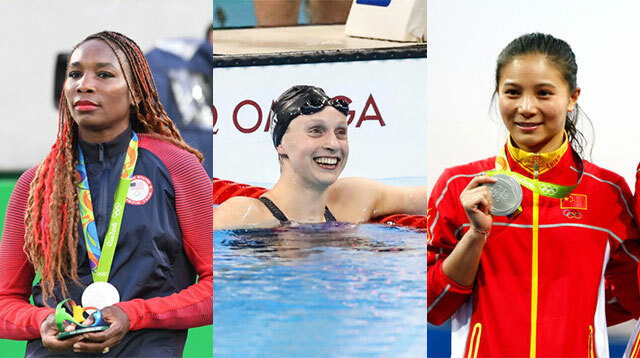 But that doesn't mean she swims "like a man" or that her times are even "good for a guy." It just means she can keep up with basically ~anyone~ and that she's beyond talented. But is it right to constantly refer to this elite athlete in terms of her new motherhood? She's featured in headlines that say "New mom Dana Vollmer wins bronze in women's 100 fly," and"Dana Vollmer Wins Bronze Medal 17 Months After Giving Birth." It's great to celebrate mamas, but let's also remember that Vollmer was just as incredible before she had a child. @CBCOlympics But to imply a proposal is, especially for a woman athlete, "better" than a medal--just no. @CBCOlympics No. A proposal is not "better" than a medal. Both are wonderful (assuming you want to marry the person).